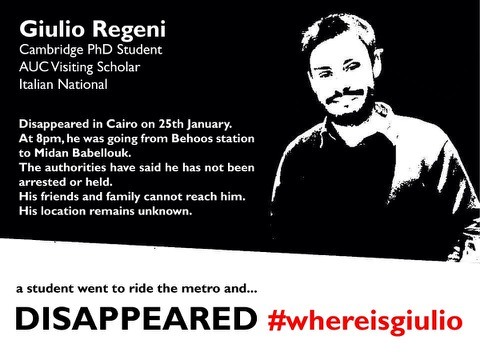 The issue of enforced disappearances in Egypt hit the global headlines in February, with the discovery of the body of missing Italian doctoral student Giulio Regeni, who vanished in Cairo on 25 January. Giulio was a doctoral researcher at the University of Cambridge who was doing fieldwork in Egypt for his dissertation on independent trade unions. An autopsy carried out in Italy showed that he had been tortured to death. Egyptian prosecutors initially also confirmed that there were extensive signs of torture on his body, but other official sources in Cairo put out conflicting statements claiming that Giulio died in a traffic accident. Although Giulio’s horrific death threw a spotlight on disappearances and torture in Egypt for the international media, such experiences are all too common for Egyptian activists and human rights campaigners. The Egyptian Commission for Rights and Freedoms documented 340 cases of enforced disappearance between August and November 2015 alone. In many cases victims reappeared in police custody, although some were found dead. The ECRF identified the National Security Agency, which reports to the Ministry of the Interior, and the Military Intelligence Department of the Armed Forces, as being involved in many cases of abduction and torture. El Nadeem Centre, a well-known Egyptian human rights NGO which supports victims of torture, is also involved in documenting cases of forced disappearance, torture and deaths in detention. For January 2016 the Centre reported on 195 deaths, 42 cases of torture, including 8 people who were tortured to death, 60 cases of medical neglect, 20 cases of group violence by the police, 66 forced disappearances, while 32 people were reported to have reappeared in various places of detention, in some cases months after they vanished. Amnesty International’s work has highlighted many horrific examples of torture in Egyptian police stations. The police station in the Cairo district of Al-Mattariyya has a particularly violent track record: three detainees died there from torture and neglect in the space of a single week in late February 2015. According to El Nadeem Centre a total of 7 detainees died in Al-Mattariyya during 2015. Disappeared who emerge in police detention or in prison are not safe from abuse. El Nadeem’s figures for January 2016 include 11 cases of death in prisons and police stations as a result of medical neglect. Academics at the University of Cambridge and across the world have launched a call for a independent inquiry into all cases of forced disappearances, torture and deaths in detention during January and February in Egypt. Sign up for online for updates on the campaign.